Sampling the specialty restaurants and splurging on a night at the chef's table are, for foodies, key elements of the cruise experience. But for some, dining is not enough — learning how to prepare that Cajun-style shrimp or molten chocolate makes all the difference when searching itineraries. 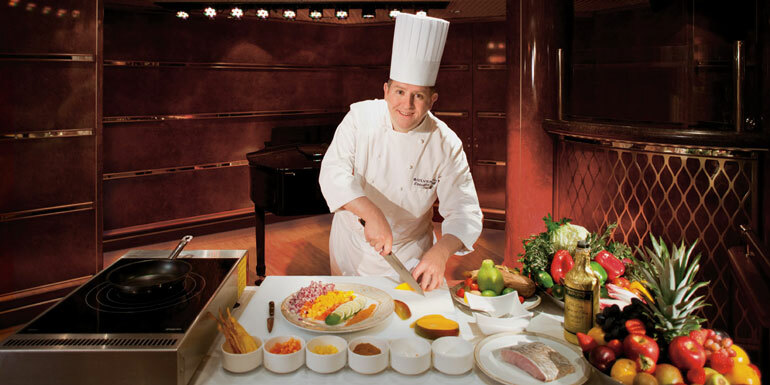 Fortunately, several cruise lines answer the call of the home chef de cuisine with cooking classes at sea. Holland America, Oceania and Silversea provide hands-on cooking lessons for passengers, and are backed by titans in the food and wine industry. Ready to sharpen your knives and cooking skills at sea? Here's a rundown on three floating culinary schools. Bon voyage! Bon Appetit's namesake cooking program aboard Oceania's Marina and Riviera cruise ships is the world's only hands-on culinary studio at sea. Regional cuisine is the theme with classes such as magical Morocco, Turkish Arabesque, Mexican Fiesta and Modern Nordic in which guests pair up at 12 professional cooking stations to re-create recipes demonstrated by the ship's master chefs. Want to master a skill? Course offerings also include specialty instruction on French techniques, fish cookery and curing, pasta making and decadent desserts. Plus, learn to make dishes from Red Ginger, Marina and the Riviera's acclaimed Asian restaurant. To enhance your experience, sign up for a full-day Culinary Discovery Tour, where you'll join your chef at a local market to shop for products to use at an in-port cooking class. Oh, and count on a cocktail or glass of champagne to facilitate your culinary prowess. 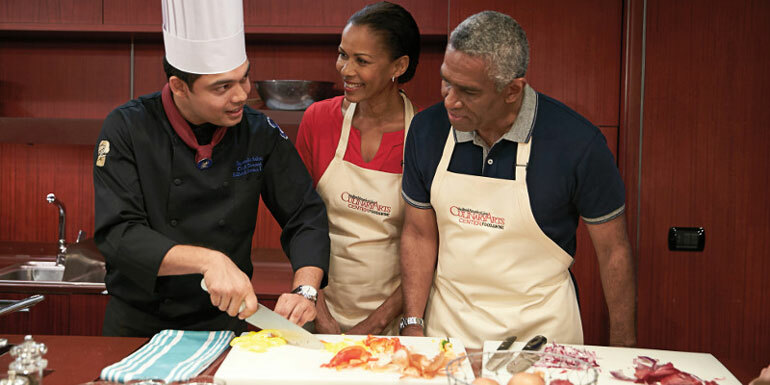 Silversea's cooking school isn't in session during every sailing or available on all Silversea ships, but each season at least 10 cruises fire up their stoves for lessons. If you're looking to up your kitchen game, it's worth following the schedule, because what foodie wouldn't love to be under the tutelage of a classically trained chef? Silversea's program balances demonstrations with hands-on workshops that hone your cookery chops, such as knife skills, cheese-making and how to cook with wine, as well as teach regional specialties like tapas, French pastries, sushi, Basque pintxos or Moroccan fare. Culinary excursions to Relais & Chateâux properties, market tours, guest chefs and cooking competitions keep the curriculum lively. Food & Wine magazine sponsors the Culinary Arts Center on each of the Holland America ships, means that along with classy cuisine, you can bet on wine pairings and dinner tas ma TV screens that broadcast a multitude of demonstrations, often by a celebrated guest chef. Intimate, hands-on classes are generally freestyle, and cruisers can do as much or as little as they wish while preparing dishes under the chef's supervision. Menus change but follow the ship's voyage by highlighting culinary culture and local produce: northwest seafood on Alaska sailings, jerk chicken on Caribbean itineraries, Cornish game hens and tiramisu in the Mediterranean. 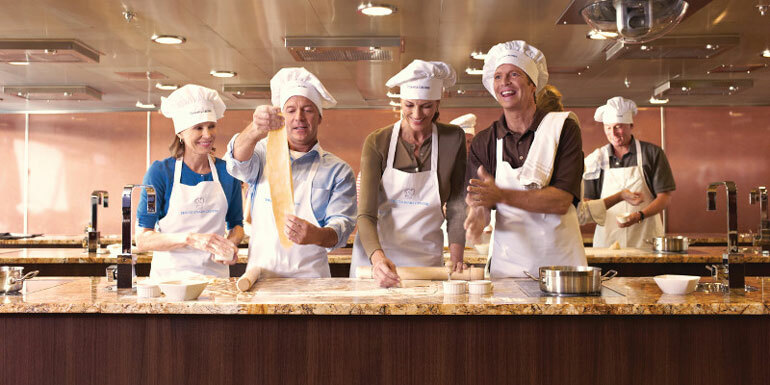 Even kids can develop their cooking skills in a youth culinary program offered on select sailings. 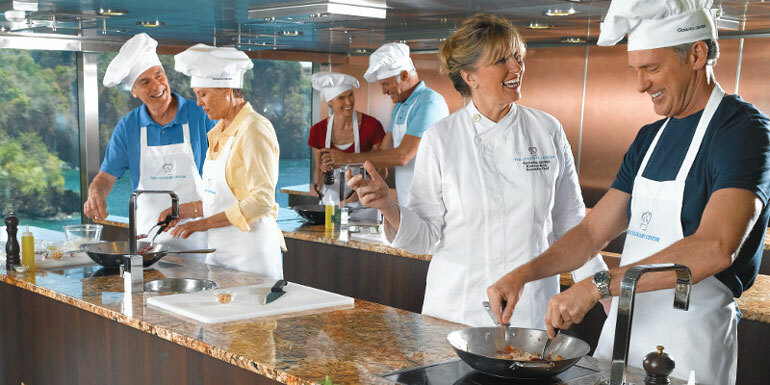 Have you taken an onboard cooking class?